By Keith Cowing on September 26, 2013 5:14 PM. "Perhaps most notable among findings from the ChemCam team is that all of the dust and fine soil contains small amounts of water." "But Curiosity is far more than a one-trick rover, and in a paper published today in the journal Science, a team of MSL scientists reports its analysis of a surprisingly Earth-like Martian rock that offers new insight into the history of Mars's interior and suggests parts of the red planet may be more like our own than we ever knew." "The Mars Curiosity rover has been a huge boon for NASA - tapping into the public's fascination with space exploration and the search for life on other planets. Its landing was watched live by millions of people, and interest in the photos and videos it is collecting is so great, that NASA has had to relocate its servers to deal with the capacity. So what does NASA do to reward this outpouring of public interest (not to mention to $2.5 billion taxpayer dollars that made it possible)? They publish the first papers to arise from the project behind a Science magazine's paywall." By Keith Cowing on September 26, 2013 12:06 PM. Keith's note: I am really baffled by this. I got this unsolicted email today from the JPL OIG. I had no idea that this SOFIA audit was going on. My reply (to PAO, OIG): "Thanks for thinking that I may have opinions relevant to your audit/investigation. But what I want to know (and, heads up, I consider this to be newsworthy and hence publishable) is why are you using an official NASA.gov email address to send me (media) wholly unsolicited email with threatening legal language attached with regard to disclosure of this unsolicited email? Again, thanks for thinking I might have useful commentary, but I do not like to have people in government positions send me news about a government activity - in an official capacity - and then dangle legal threats at the bottom of the very same email." After I sent my response I got this "Xu, Tiffany L (0920-NASA) would like to recall the message, "NASA - Discussion regarding SOFIA"." Duh. I do not work at NASA so you can't "recall" anything. Then I got the same (original) email again. I do not care what legal language the OIG attached. The email was official, unsolicted, and sent again after an initial complaint. Keith's 30 Sep note: Neither PAO or the OIG has responded to the comments I included when I forwarded all of this to them. I have to therefore assume that they have no issues with this process. Mr. Cowing, My name is Tiffany Xu and work for NASA Office of Inspector General out of our field office at JPL. Currently we are conducting the survey phase of an audit on the SOFIA project. Since SOFIA has had many delay of instrument deliverables, one of the question that we are be tasked to find out is how astronomical society feel towards SOFIA: is it still an observatory that the general community is excited about, is the project delivering what it has been promised, and is it still relevant considering the up and coming JWST. Continue reading NASA OIG Seeks Media Commentary For SOFIA Audit. By Keith Cowing on September 26, 2013 12:00 PM. "However, while the Agency's procedures meet Federal requirements, its implementing directive does not require Agency personnel with classification authority to receive all necessary training. Additionally, we found instances in which Agency personnel were not consistently following these NASA policies. Specifically, we found classified documents that were improperly marked,training requirements that were not met, and self-inspections that were not fully implemented. Although these deficiencies were relatively minor in nature, failure to comply with these requirements increases the risk that personnel may inadvertently misclassify material." Will China Continue to Lurk at ISECG? By Keith Cowing on September 24, 2013 9:39 AM. "One non-Chinese government official said China is already an observer to the ISECG [International Space Exploration Coordination Group] work and that it was China, not ISECG, which in the past had resisted China's joining as a full member. NASA Administrator Charles Bolden, who regularly fields questions about the apparent U.S. government policy of hostility to China's space efforts during annual conferences like IAC, said nothing in U.S. policy would prevent China's becoming a full ISECG member. Bolden said that as far as he was concerned, China was already a part of the ISECG process." "NASA and the International Space Exploration Coordination Group (ISECG) released a white paper Friday outlining benefits of human exploration of space." Keith's note: If you go to the last page of the August 2013 ISECG Global Exploration Roadmap you will see a graphic of Earth surrounded by space agency logos. CNSA's logo is included. However, the word "China" or acronym "CNSA" do not appear anywhere in this document. If you go to the USECG website CNSA is listed as a member. So apparently China is "observing" - but doing little else. By Keith Cowing on September 23, 2013 9:35 AM. Keith's note: Sam Pool died this morning after a battle with cancer. His family will be making arrangements for a memorial in Houston. Details will be posted. According to NASA: "Dr. Pool served as NASA's Assistant Director of Space Medicine in the Space and Life Sciences Directorate at the Johnson Space Center (JSC) during Phase 1. He and the flight surgeons were responsible for providing medical support to the astronauts and their families pre-flight, in-flight, and post-flight, They were also in charge of training the crews in medical techniques necessary and potentially necessary on-orbit. Pool has worked for NASA since the Apollo Program and helped to develop a set a of medical standards for spaceflight, which are used to medically screen astronauts." By Keith Cowing on September 20, 2013 2:39 PM. "NASA is the ninth largest Federal Government property holder, controlling approximately 4,900 buildings and structures with an estimated replacement value of more than $30 billion. More than 80 percent of the Agency's facilities are 40 or more years old and beyond their design life. However, NASA has not been able to fully fund required maintenance for its facilities and in 2012 estimated its deferred maintenance costs at $2.3 billion. Moreover, a 2012 Agency study estimated that NASA may have as many as 865 unneeded facilities with associated annual maintenance costs of more than $24 million." "According to NASA's own study, the agency has a backlog of nearly $2.2 billion in deferred maintenance. NASA is the ninth largest real property holder in the federal government. However, nearly 80 percent of the agency's facilities are 40 or more years old." Keith's note: Summary: NASA does not admit that there are any problems and wants you to think all is well. NASA does not really do anything to address the issues raised by everyone else, but they sure do a lot of studies. By Keith Cowing on September 20, 2013 10:17 AM. "The U.S. Government Accountability Office (GAO) has identified a high probability in degraded weather satellite coverage starting as early as next year, and has designated this data gap as a new high-risk area in a report earlier this year. Given this potential gap in weather satellite coverage, today's hearing addressed questions about the administration's priorities in funding weather satellites and research as compared to climate change-monitoring satellites and research." By Keith Cowing on September 19, 2013 7:23 PM. "The country's scientific stockpile has dwindled to around 36 pounds. To put that in perspective, the battery that powers NASA's Curiosity rover, which is currently studying the surface of Mars, contains roughly 10 pounds of plutonium, and what's left has already been spoken for and then some. The implications for space exploration are dire: No more plutonium-238 means not exploring perhaps 99 percent of the solar system. In effect, much of NASA's $1.5 billion-a-year (and shrinking) planetary science program is running out of time. The nuclear crisis is so bad that affected researchers know it simply as "The Problem." By Keith Cowing on September 19, 2013 3:49 PM. "In China we will be meeting with the heads of international partners of the International Space Station [ISS], as well as the heads of some space agencies that don't participate, but with whom we have partnership," he said. Bolden did not respond directly when the South China Morning Post in a media conference call asked about collaboration between US and China in such areas as manned space flights. "We also support any nation that seeks peaceful utilisation of space, and that goes to everyone," he said." By Keith Cowing on September 19, 2013 1:12 PM. Keith's 19 Sep note: More than half of these websites are still offline. Wow. NASA really does not have a lot of resiliency when it comes to responding to a hacking event, despite what PAO would have you believe. 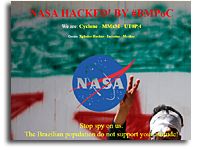 "At no point were any of the agency's primary websites, missions or classified systems compromised," said Nasa spokesman Allard Beutel. "We are diligently taking action to investigate and reconstitute the websites impacted during web defacement incident," he said." By Keith Cowing on September 18, 2013 9:02 PM. "China is willing to provide training and open the Chinese space station to foreign astronauts, senior space flight officials said. "We would like to train astronauts from other countries and organizations that have such a demand, and we would be glad to provide trips to foreign astronauts," said Yang Liwei, deputy director of China Manned Space Agency. "We will also welcome foreign astronauts who have received our training to work in our future space station." Yang, China's first astronaut, who went into space in 2003, said many countries submitted proposals to the Chinese government during the development of the space station, hoping China would help train their astronauts and then send them to the station to conduct scientific experiments. "The effect of including foreign participants in our space programs is not only that these nations can send their people to outer space, but also that we will enable them to develop their own space projects." Yang made the remarks during the five-day United Nations/China Workshop on Human Space Technology, which opened in Beijing on Monday." By Keith Cowing on September 18, 2013 3:32 PM. "However, prudent management requires that we be prepared for all contingencies, including the possibility that a lapse could occur at the end of the month. A lapse would mean that a number of government activities would cease due to a lack of appropriated funding. It would also mean that a number of employees would be temporarily furloughed. To prepare for this possibility, we are working with our General Counsel and our Chief Financial Officer to update our contingency plans for executing an orderly shutdown of activities that would be affected by a lapse in appropriations." "With the turmoil of the DOI snafu and its 4-day delay in paychecks fresh on our minds, you need to be acutely aware that a shutdown could have a much bigger financial impact on you and your family, especially given that we would not likely receive retroactive pay as we did after the shutdowns of the 1990's. Please act accordingly and keep some funds in reserve, if you possibly can." By Keith Cowing on September 18, 2013 11:03 AM. 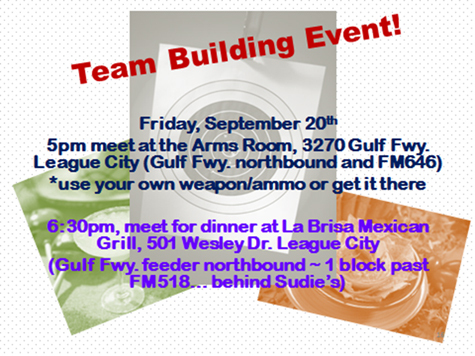 Keith's note: Looks like all the invitees to this gun shooting team building event are from JSC Code NA - Safety and Mission Assurance Office. This was sent out the day after the Navy Yard shootings here in Washington, DC. I wonder if these JSC "safety" folks would have announced such a team building event the day after that horrible shooting incident they had at JSC a few years ago? Also - what if one or more of the people who got this email do not want to participate in a gun-related activity as part of their day job? Does that mean that they are not "team" players? How can their management put them into such a position as civil servants? Subject: Please join in our TEAM BUILDING EVENT! By Keith Cowing on September 13, 2013 4:37 PM. 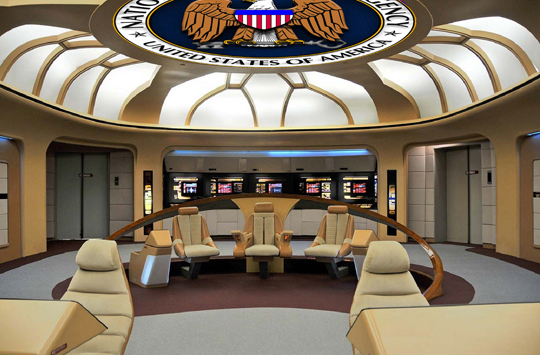 "A long, fascinating profile of NSA "cowboy" Gen. Keith Alexander in Foreign Policy reveals that the top spook is fan of science fiction movies and built his old command room to look like the bridge of the Enterprise from Star Trek: The Next Generation. He sold members of Congress by letting them sit in the big chair and "play Picard." 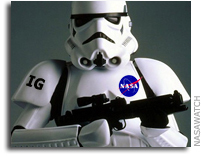 "We are NASA, not NSA"
By Keith Cowing on September 13, 2013 4:30 PM. "- Contrary to the nonsense you've been reading at nasawatch or elsewhere, NASA does not obtain control of your personal device; NASA cannot remotely read the contents of your device; NASA does not know your unlock code; and NASA will not remotely trigger a wipe of your personal device without your direct authorization to do so. We are NASA, not NSA. Don't drop the first 'A', eh?" "Employees using their own mobile device for downloading NASA email /calendar directly via their phone's mail client should be aware that NASA has the ability to access your device and to erase ("wipe") it. While the current NASA policy is that no such access or wiping will occur without the employee's explicit permission, it remains possible that such adverse events could nonetheless occur inadvertently." Keith's note: Funny how the same group of IT people who were unable to prevent the loss of personal information for hundreds of NASA employees, repeatedly allowed personal employee data to get onto latops that were taken outside of the agency, is unable to stop website hacks, and stumbled over itself to figure out how to encrypt data on laptops, can be so certain that data on your mobile device will never be affected (by NASA) if you connect to NASA's networks. By Keith Cowing on September 13, 2013 2:48 PM. "Having trouble getting excited about NASA's planned mission to redirect an asteroid? Maybe William Gerstenmaier can help. "Turn off your logical side and turn on your touchy-feely side, the one you almost never use," Gerstenmaier, associate administrator for NASA's Human Exploration and Operations Directorate, told attendees of an aeronautics and astronautics conference Wednesday in San Diego. "Then jump up and down and do some break-dancing. We're going to grab a space rock and we're going to move it!" Keith's update: Response from HEOMD AA Bill Gerstenmaier to NASAWatch: "We provided an hour on technical details, reasons and logic for the asteroid mission. The mission fits well with expanding experience in beyond low earth orbit. We showed charts that show how this mission supports Mars. We also had discussions on this mission supporting commercial asteroid activities. The logic, rational, and feasibility were covered in a detailed manner. I added a flip comment at the end. This is predominately what the LA times picked up. They might have understood the humor intended. The web cast and briefing show the thoughts and work that the teams have put into a very creditable mission. Other articles capture the technical discussions and logical points well." Keith's 12 Sep note: This is typical of NASA's increasingly baffling asteroid mission PR strategy. Since no one at NASA (starting with Charlie Bolden) is able to give a clear reason why NASA wants to spend billions of taxpayer dollars to go grab an asteroid and move it to lunar orbit, they just skip "the logical side" and go for "the touchy-feel side". Now they want you to just "jump up and do some break-dancing". In other words, don't worry - be happy. 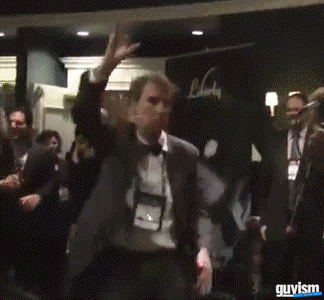 Continue reading NASA's Goofy New Asteroid Mission Strategy: Don't Worry - Be Happy (Update). By Keith Cowing on September 13, 2013 12:44 PM. "No one wants their personal property tampered with -- we understand that. If you complain loudly because your device does something you don't like as a result of the policies and settings pushed to your personal device as a result of our efforts to improve IT security, or if mistakes are made and you happen to be the unlucky victim of one, and it gets enough attention, either personal devices may be banned in the future from connecting to NASA email and non-public facing systems, or you'll have to officially request the ability to connect a personal device, take SATERN training, sign paperwork explicitly accepting the risks to your personal device or data, and so on. That will add more bureaucracy and obstacles and hassles to doing what should be a reasonable thing, which is enabling you to read and respond to email via your personal devices. It's up to you how you respond to these changes. If you don't want NASA making any changes to your personal devices, please do not connect your personal device(s) to NASA email or internal networks. This is a compromise that allows your flexibility and choice. And please note that these changes will help protect your personal data on the device, not just NASA data." Keith's note: In other words NASA wants you to think that they are doing you a favor by allowing you to use a cellphone that you paid for to do government work. Also ... if you use your personal device to connect to NASA and something goes wrong you had better shut up and do not complain about it - or bad things will happen. By Keith Cowing on September 13, 2013 10:22 AM. Keith's note: NASA NSSC employees are getting this memo today from DOI (who does NASA payroll). Looks like it may affect other parts of NASA. Someone at NASA HQ who uses NFCU got a direct deposit but another person at NASA HQ who uses a regular bank did not. The Official Pay Date for all agencies is the second Tuesday following the end of the pay period. Generally payments are provided to Financial Institutions for an early deposit prior to the Official Pay Date. This is routinely accomplished by the first Friday following the end of the pay period. An oversight occurred during the certification process for pay period 2013 19, which inadvertently disbursed the EFT payments after the Friday, September 13, 2013. Efforts to process a new payment file with Department of Treasury was unsuccessful. Therefore, the payments will be made by the Official Pay Date, September 17, 2013. Next pay period we will resume to our normal processing. We apologize for any inconvenience to employees. We recommend you distribute this memorandum or information to your Servicing Personnel. Continue reading Payroll Screw Up Delays NASA Paychecks (Update). By Keith Cowing on September 12, 2013 10:42 PM. Check ignition and may frog's love be with you"
Is Charlie Bolden Going To Visit China? By Keith Cowing on September 12, 2013 10:33 PM. Keith's note: According to this Facebook post: "On September 21 the Space Generation Advisory Council is hosting its SGC Gala Dinner in Beijing, China. Enjoy a nice evening with young professionals, students, and current space leaders from around the world, as well as our featured speaker, Charles Bolden, NASA Administrator." Isn't NASA supposed to be avoiding interactions with China? Or is Bolden just going to phone his speech in? I wonder if Frank Wolf knows about this. By Keith Cowing on September 12, 2013 3:11 PM. "Individuals with a security clearance have agreed to certain restrictions regarding classified information. Accessing classified information on Wikileaks, even from home, constitutes a security violation. Viewing classified information from a computer that isn't authorized to access classified information, and/or viewing classified information that he or she is not authorized access to, is a security violation. And, use of official Government computers for other than authorized purposes is prohibited by federal ethics laws." By Keith Cowing on September 12, 2013 11:10 AM. Keith's 11 Sep 7:00 pm EDT note: Looks like NASA will admit on Thursday that Voyager 1 has indeed left our solar system, but that it did so more than a year ago. NASA prefers Yes/No answers i.e. has it or has it not crossed that imaginary dotted line that is in place around the edge of our solar system. The press event will be at 2:00 pm EDT. NASA has still not sent out a media advisory. What's sort of funny is how all of the science types go back and forth as to whether Voyager 1 has or has not crossed this imaginary line that marks the boundary of our solar system - when no one has never been to the place where that line is - and the line is based on things we expect to find - but we don't exactly know when/where that magic line crossing will actually happen (or have already happened). What I want to know is when Voyager 1 becomes VGER. Just wondering. Jonathan McDowell agrees and wants NASA to rename Voyager 1 as "VGER" now - i.e. "Voyager Grand Extrasolar Recon". 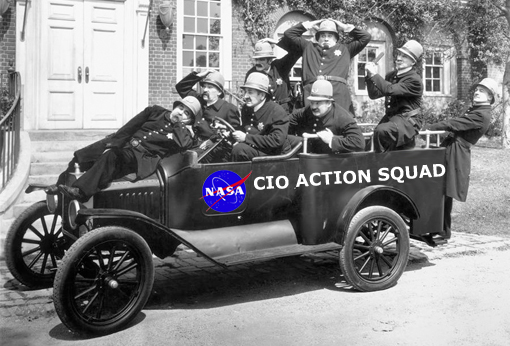 Keith's 12 Sep 11:00 am EDT update: NASA PAO finally squeezed out a media advisory. "NASA will host a news conference today at 2 p.m. EDT (11 a.m. PDT), to discuss NASA's Voyager mission. It is related to a paper to be published in the journal Science, which is embargoed until 2 p.m. EDT." "New and unexpected data indicate Voyager 1 has been traveling for about one year through plasma, or ionized gas, present in the space between stars." By Keith Cowing on September 11, 2013 5:16 PM. Keith's 3:10 pm EDT note: LADEE slipped into safe mode again yesterday morning when its star trackers experienced an alignment error. This error has been fixed and the spacecraft is expected to exit safe mode today and proceed normally with the mission. Keith's 5:16 pm EDT update: I just got this baffling update from ARC PAO 4 hours after I asked for a statement (they have been sitting on this for 3 hours): "On Sept. 10 around 7 a.m. Pacific Time, the spacecraft went into safe mode due to an alignment error between the two star tracker camera heads affecting the rate estimator when the sun occludes one of the cameras. We corrected that and came out of safe mode this morning, Sept. 11, to resume normal operations. To keep the media and public informed about the spacecraft status, NASA will issue weekly Project Manager Updates written by Dr. Butler Hine. The incident that occurred Sept. 10 and was corrected Sept. 11 will be in the next Project Manager Update." Why isn't @NASALADEE tweeting about this? It happened more than 24 hours ago. Why isn't the official NASA LADEE website being updated with this information? Why is NASA ARC PAO waiting for a "weekly project manager update" to release this information to the public? What else are they not releasing? Keith's 7:29 pm EDT update: according to this tweet: @worden: After two not unexpected glitches since launch @NASALADEE just demonstrated main propulsion system. By Keith Cowing on September 11, 2013 12:08 PM. "Starting Tuesday, five astronauts will spend five days living and working at the Aquarius Reef Base. While they're underwater, they'll be trying out an exercise device that could be used on the International Space Station and spacewalking tools." Keith's note: NASA Astronauts living underwater - sound familiar? NASA's NEEMO used to do this. Not any more. NASA killed NEEMO. Now they have a stealthy low-key version they call "Space Environment Analog for Testing EVA Systems and Training (SEA TEST)". There is no mention of this activity at NASA HQ. JSC has a page up but no press release was ever issued. No mention of "NEEMO" is made - not even in photos that are shown from earlier NEEMO missions. Why is NASA being so shy about this activity? Is NASA embarrassed to admit that it killed NEEMO? Among the current visitors of the Aquarius Facility is legendary aquanaut Sylvia Earle. You'd think that some one at NASA would be paying attention. Think again. By Keith Cowing on September 11, 2013 11:51 AM. Keith's note: 1.7 million views so far. I have ridden a full acceleration simulation of SpaceShipOne's flight in the NASTAR Centrifuge. Rest assured - this has got to be quite a kick - even more so in reality. By Keith Cowing on September 11, 2013 9:36 AM. "The news from Earth that morning wasn't good. Frank Culbertson would soon find that some of the day's pre-planned routine would be altered. As soon as he was told of the attacks, Culbertson checked to see when they would be passing over the east coast of the U.S. Discovering that this was only some minutes away, Culbertson grabbed a camera. The window in Mikhail Tyurin's cabin turned out to be the one with the best view." By Keith Cowing on September 11, 2013 9:26 AM. "a. The use of your own mobile device (i.e., cell phone or tablet) to retrieve your NASA email/calendar or to conduct NASA business is entirely voluntary. Users should refrain from using a personal mobile device to access NASA information and systems if uncomfortable, unable, or unwilling to comply with these minimum security requirements. As the use of personal mobile devices is purely optional, employees cannot be expected to use their own devices to accomplish their assigned tasks if they choose not to do so. Your supervisor may not require you to do so. If a mobile device is required for you to perform your assigned duties, management will provide you with an appropriate NASA-owned device consistent with the Negotiated Agreement, unless you voluntarily choose to use your own device. You cannot be required to provide your personal email address or cell-phone number to management. b. Employees using their own mobile device for downloading NASA email /calendar directly via their phone's mail client should be aware that NASA has the ability to access your device and to erase ("wipe") it. While the current NASA policy is that no such access or wiping will occur without the employee's explicit permission, it remains possible that such adverse events could nonetheless occur inadvertently. Therefore, employees should backup their personal phones often to reduce their vulnerability of data loss." By Keith Cowing on September 10, 2013 11:25 AM. "Is science fiction a big source of inspiration? Here, there's almost a secret handshake among engineers who have read lots of science fiction. It lets you dream - how can we make that technology real, how can we make a better future? What are your dreams for exploring space? A principal tenet of science fiction is that there are planets out there with intelligent life. For most of the history of astrophysics we haven't been able to see those worlds, but we are starting to see planets like Earth. I dream of going to those worlds. That's my life's inspiration. What excites you most about your work? This century, even more than the last one, is the space century - especially with the private sector and many more countries getting involved. The stuff we're doing at Ames is turning science fiction into fact. This is the coolest job I have ever had." Just How Realistic is the Eyepopping Film "Gravity"? By Keith Cowing on September 10, 2013 11:08 AM. "I usually try not to nitpick space movies, because they are entertainment, not documentaries, but when folks start heaping praise on a movie as the best space movie or most realistic, I feel the need to chime in." By Keith Cowing on September 10, 2013 11:05 AM. 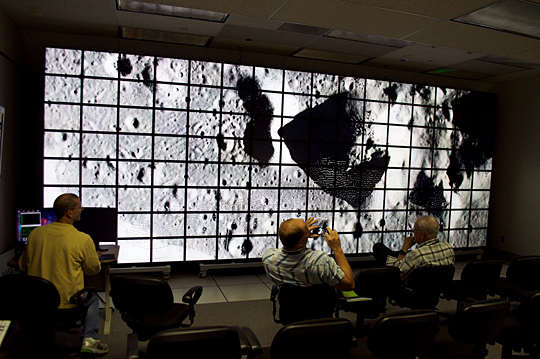 "Last week one of the images retrieved by the Lunar Orbiter Image Recovery Project (LOIRP) was presented on the NASA Ames Hyperwall visualization system. The image that was presented was a portion of the floor of crater Copernicus taken by Lunar Orbiter 5 on 11 August 1967. Specifically frame 5151_H1. FYI at the native resolution of this restored image and the resolution of the individual monitors used in this hyperwall, we'd need 50 - yes fifty - hyperwall 2 set ups to show this LOIRP image at its full resolution." With Garver Gone, Who Speaks For NASA? By Keith Cowing on September 9, 2013 4:32 PM. "Bolden, a retired Marine Corps major general and former shuttle commander loyal to his troops and trusted by lawmakers, had quickly lost the White House's confidence in his ability to explain and defend administration policy. During his first week on the job, NASA abruptly canceled a long list of scheduled media interviews with Bolden after the White House took issue with his performance during a televised all-hands meeting. Among the causes for concern, current and former administration officials have told SpaceNews, was Bolden's off-script comments about the Moon and Mars and the role NASA would play in a National Security Council-led space policy review then getting underway. "When the budget came out, they were not comfortable he could defend it," one official said. Subsequent NASA press briefings often were held via teleconference with Bolden reading an opening statement before turning it over to Garver or another official to field questions. It is Garver who will forever be known as the champion of NASA's Commercial Crew initiative, which aims to outsource crew transportation to and from the international space station." By Keith Cowing on September 9, 2013 11:05 AM. "Lori Garver, leaving NASA after four years as deputy administrator, said NASA and Congress long have oversold the agency's ability to build the rocket, called the Space Launch System, and its Orion capsule on an annual budget of roughly $3 billion. "It's very clear that we could have slips of a year or two," said Garver, referring to both the 2017 launch -- which won't have a crew -- and the first planned flight of NASA astronauts aboard the SLS rocket in 2021. "People are more optimistic than ... reality," she said in an interview with the Orlando Sentinel." "So what you've got is a beast of a rocket, that would give you all of this capability, which you can't build because you don't have the money to build it in the first place, and you can't operate it if you had it." By Keith Cowing on September 7, 2013 9:33 PM. "NASA has confirmed that the reaction wheels of its Lunar Atmosphere and Dust Environment Explorer (LADEE) were successfully brought back on-line and the spacecraft has acquired its safe-mode attitude profile." Mission updates will be carried on NASA TV. You can also track mission status by following @NASALADEE or at the mission website. "Optical laser communications will enable a variety of robust future science and human exploration missions--providing a higher data rate, and delivering more accurate navigation capabilities with reduced size, weight, and power requirements. Someday, maybe, the Solar System will be peppered with a high-speed interplanetary communications network much like the wireless Web currently spinning here on Earth." By Keith Cowing on September 6, 2013 4:10 PM. Keith's note: A farewell reception was held at NASA Headquarters on Thursday for NASA Deputy Administrator Lori Garver. In addition to the long list of thank yous to staff and friends, Garver had some parting observations and recollections to share. Garver said that she had three personal objectives while at NASA: "to try and align NASA with national objectives; to provide value to taxpayers; and to try and be a consistent leader." Responding to criticism she said that people had characterized her as just pushing change for the sake of change, being the "commercial crew girl" or "asteroid girl". She chalked this off as being the outcome of having worked to advance her overall goals. As for her relationship with Charlie Bolden she said they they had "the best relationship team of any NASA Administrator and Deputy in my history and I've seen a lot of them", that she "learned so much from Bolden". Garver reflected back to her efforts before being nominated to be Deputy Administrator - specifically leading the Obama transition team in 2008 following the election. She noted that she and her team had a "rocky start" and that she was "the only member of the entire transition team that had to deal with an agency head (Mike Griffin) who was openly hostile to the team and who had instructed his folks not to share information with us." Garver noted that Griffin "had a campaign headed by his wife that sought to try to keep him in his position." She joked that this whole drama ended up giving her more visibility within the senior leadership of the transition team than might otherwise have been the case. Continue reading Notes From NASA Deputy Administrator Garver's Farewell Reception. By Keith Cowing on September 5, 2013 8:27 PM. "An experienced Russian spaceman set to fly to the International Space Station (ISS) in 2015 suddenly tendered his resignation for unclear reasons, a Russian space industry representative said Thursday. Yury Lonchakov will be formally discharged from his job on September 14, Irina Rogova of the Gagarin Cosmonaut Training Center told RIA Novosti. Rogova's boss, Sergei Krikalev, was cited by Russian media as saying that Lonchakov "found a more interesting job," but did not elaborate. Rogova could not name Lonchakov's new job." Keith's note: Lonchakov flew on STS-100, Soyuz TMA-1, and Soyuz TMA-13/Expedition 18. So he certainly has had some spaceflight experience. Time to do new things, I suppose. This is sadly interesting, however: "Once a dream job for Soviet kids, being a cosmonaut does not hold much allure in modern Russia: Only 5 percent of adult Russians actually wanted to grow up to be cosmonauts, with doctors, teachers, truck drivers and aviators all being more popular, according to a 2011 study by the Public Opinion Foundation. Russia's first-ever open cosmonaut recruitment drive attracted a mere 300 applications last year, compared with 6,000 for NASA in 2011." By Keith Cowing on September 5, 2013 2:52 PM. 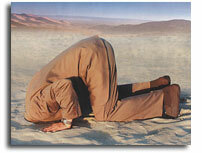 Keith's note: Due to sequestration, civil servants at some agencies have sacrificed with mandatory furloughs. NASA cut travel instead. Yet some NASA civil servants are accepting their portion of the agency's sacrifice by traveling to a foreign resort at taxpayer expense. 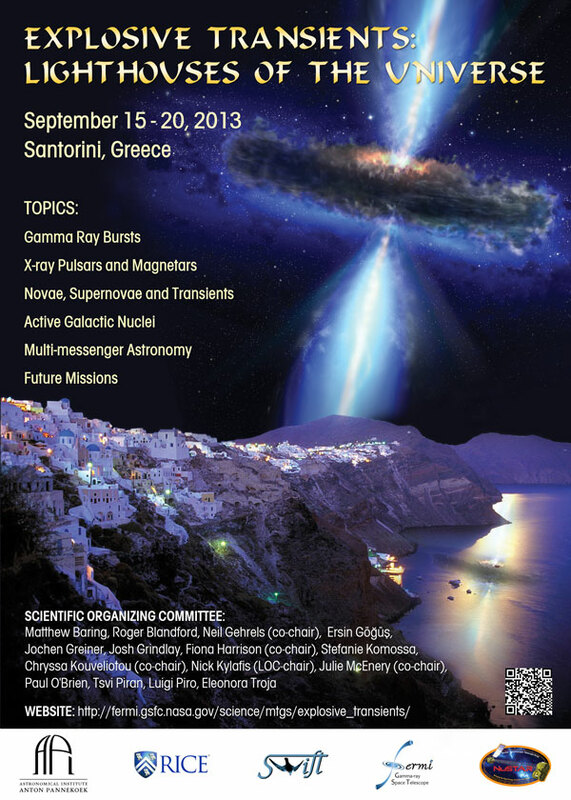 According to this GSFC web page, a conference titled "Explosive Transients: Lighthouses of the Universe" is being held 15-20 September 2013 in Santorini, Greece. The co-chairs of this conference are Neil Gehrels, Fiona Harrison, Chryssa Kouveliotou, and Julie McEnery. Three of them are NASA civil servants (Fiona Harrison is not). The participants of this conference include at least five NASA civil servants: Kouveliotou, Gehrels, Racusin, McEnery, and Cenko. The meeting is being held at the Petros M. Nomikos Conference Center which is "located at Firostefani on the outskirts of Fira, the capital of Santorini island. It is a neoclassical mansion, overlooking the caldera and the volcano.". In addition to the meeting NASA is sponsoring an Optional Boat Tour of the Caldera and the Volcano and "Homemade lunch, local wine and fruits will be served on board!" 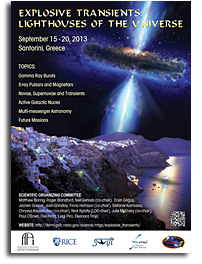 Indeed, NASA went out of its way to create a poster for the event which shows a black hole rising over the scenic island of Santorini (enlarge). Three NASA missions are listed as sponsors. The meeting is chaired by NASA civil servants. NASA's travel policies state that "Foreign conference participation and sponsorship is prohibited unless the conference as a whole is specifically approved by OCFO." So who in the NASA CFO Office approved this Fall vacation on Santorini? Keith's 5 Sep update: This is not the first time that these NASA astronomers have been to Santorini on official business. Gehrels and Kouveliotou were also involved in a 2005 meeting on Santorini and are also shown in a picture from a 2003 event - also on Santorini. Neil Gehrel's father Tom Gehrels was even involved in the discovery of an asteroid that was eventually named 19034 Santorini - originally discovered in 1960. What a coincidence. Keith's 6 Sep update: According to NASA PAO: "When sequestration guidelines were enacted, NASA canceled its planned $10,000 sponsorship of this conference. NASA has not contributed any funding. Also, the agency is sending only six civil servants and their participation has been approved by the Office of the Chief Financial Officer under the required waiver process. All six will be involved in meetings with international partners regarding the future operation of NASA gamma-ray missions such as Swift and NuSTAR. Any of the six participating in the optional boat tour will be required to purchase a ticket at his or her own expense. The conference poster was produced by another conference organizer, not NASA. The Goddard Space Flight Center Web page on which it appears was created when the conference was organized and before restrictions on foreign conference attendance were in place. "Explosive Transients: Lighthouses on the Universe" is one in a series of conferences being sponsored by scientific organizations around the world. The conference is an opportunity not only for science presentations, but also for these organizations to do joint planning of gamma ray missions." By Keith Cowing on September 5, 2013 11:23 AM. "Visit http://www.gov.uk/fco for British foreign policy news and travel advice and http://blogs.fco.gov.uk to read our blogs. Please note that all messages sent and received by members of the Foreign & Commonwealth Office and its missions overseas may be automatically logged, monitored and/or recorded in accordance with the Telecommunications (Lawful Business Practice) (Interception of Communications) Regulations 2000. We keep and use information in line with the Data Protection Act 1998. We may release this personal information to other UK government departments and public authorities." Why is anyone at NASA (an American government agency) sending out official email with a disclaimer that suggests that people (most likely Americans) visit a foreign government's official website - and then warn these same Americans that "We may release this personal information to other UK government departments and public authorities"? By Keith Cowing on September 4, 2013 10:14 PM. Click on image to animate. "In order for us to carry out our mission to get the world -- our world -- excited about and supportive of space exploration, we need to engage people everywhere. The show is watched by millions. I'll be there as your CEO of The Planetary Society and a student of Carl Sagan. Buzz Aldrin appeared on this show three years ago." Keith's note: I am the first one to suggest that NASA and space enthusiasts need to find new ways to connect to the other 99% of society who need some outreach. But I expect that the net value to the popularization of space exploration by this stunt will be the same as was the case with Buzz Aldrin's appearance on Dancing With The Stars: fleeting, hard to measure, and somewhat embarrassing. Based on this sample of Nye's jittery dance style I do not think he'll stay on the show long enough to make a difference. I don't even think that a colored mohawk haircut would help him. Wake me when it is over. By Keith Cowing on September 4, 2013 9:07 PM. "The problem with the SLS is that it's so big that makes it very expensive. It's very expensive to design, it's very expensive to develop. When they actually begin to develop it, the budget is going to go haywire. They're going to have all kinds of technical and development issues crop up, which will drive the development costs up. Then there are the operating costs of that beast, which will eat NASA alive if they get there. They're not going to be able to fly it more than once a year, if that, because they don't have the budget to do it. So what you've got is a beast of a rocket, that would give you all of this capability, which you can't build because you don't have the money to build it in the first place, and you can't operate it if you had it." "But Kraft's harshest words are directed right where they should be: at the top. 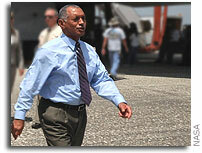 "Bolden," said Kraft of NASA administrator Charles Bolden, "doesn't know what it takes to do a major project. He doesn't have experience with that. He's never known what it takes to do a massive program. He keeps talking about going to Mars in the 2030s, but that's pure, unadulterated, BS." By Keith Cowing on September 4, 2013 8:07 PM. Keith's note: Have a look at the Twitter account @ExperienceNASA. It describes itself as "Welcome to your one-stop shop for opportunities to participate in/contribute to NASA goals/missions! Need help? Ask me! Washington, DC nasa.gov". This site is openly operated by NASA civil servant Erika Vick from her desk during the work day as part of her job as executive secretary of the NASA Advisory Council Education and Public Outreach Subcommittee. NASA has confirmed this to me more than once. Yet when you ask Erika whether this site expresses her opinions or official NASA opinions, she tweeted "@ExperienceNASA isn't official" and also tweeted "@ExperienceNASA points to http://nasa.gov ...any account can do that...had hopes it would be but alas". Yet Erika's personnal Twitter account says "@ExperienceNASA by day". Erika can't have it both ways. If she is going to sit at her desk and use a Twitter account to overtly do her day job and configure the Twitter page so as to give a clear impression that NASA is behind it then she needs to operate it in a fashion commensurate with official NASA social media accounts. Otherwise she needs to make sure it is clear that this is a personal effort she does during coffee breaks. She can't have it both ways. Is it good to try and enhance NASA EPO? Yes. Is it bad to mislead people in so doing? Yes. Once again it is clear that NASA has no standard policy for use of social media. By Keith Cowing on September 4, 2013 11:07 AM. "NASA has chosen 96 ideas it regards as most promising from more than 400 submitted in response to its June request for information (RFI) about protecting Earth from asteroids and finding an asteroid humans can explore." Is There a Radiation Gender Barrier at NASA? By Keith Cowing on September 4, 2013 9:49 AM. "Depending on when you fly a space mission, a female will fly only 45 to 50 percent of the missions that a male can fly," Peggy Whitson, the former chief of NASA's Astronaut Corps, said. "That's a pretty confining limit in terms of opportunity. I know that they are scaling the risk to be the same, but the opportunities end up causing gender discrimination based on just the total number of options available for females to fly. [That's] my perspective." By Keith Cowing on September 3, 2013 10:56 PM. "Our proposed survey requires a total of 200 days of observing time, and will find up to 100 planets in the white dwarf (WD) habitable zone. This survey will maintain Kepler's spirit of searching for habitable Earths, but near new hosts. With few-day observations and minute-cadences per field, it will also open up a completely unexplored discovery space." Keith's 3 Sep update: Additional Kepler white papers have been posted. Keith's 4 Sep update: Even more Kepler white papers have been posted. This page is an archive of recent entries written by Keith Cowing in September 2013. Keith Cowing: August 2013 is the previous archive. Keith Cowing: October 2013 is the next archive.